Published by the American College of Sports Medicine, this authoritative manual teaches health fitness professionals and students how to appropriately conduct fitness assessment testing. 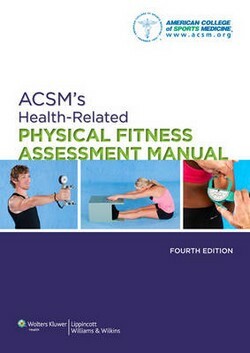 The goal of this Fourth Edition of ACSM's Health-Related Physical Fitness Manual is to provide a comprehensive overview of why and how to perform assessments of the five health-related components of physical fitness, namely body composition, muscular strength, muscular endurance, flexibility, and cardiorespiratory fitness. Features of the Fourth Edition include: reorganized and expanded information, including discussion of unique assessment principles and the major limitations of some assessment methods; step-by-step instructions for assessment of health-related physical fitness and resources for interpretation of test results; updated references to ACSM's Guidelines for Exercise Testing and Prescription, Ninth Edition; more than 110 boxes, tables, and figures to help the reader understand the concepts of health-related physical fitness; case study analysis at the conclusion of each assessment chapter and suggested laboratory activities to help students master the concepts of health-related physical fitness; and available instructor resources include fully searchable online text, an image bank, PowerPoint slides, and a Test Generator. The American College of Sports Medicine, founded in 1954, is the world's largest sports medicine and exercise science organization with more than 45,000 national, regional, and international members and certified professionals in more than 90 countries. With professionals representing more than 70 occupations, ACSM offers a 360-degree view of sports medicine and exercise science. From academicians to students and from personal trainers to physicians, the association of public health, health/fitness, clinical exercise, and health care professionals is dedicated to helping people worldwide live longer, healthier lives through science, education, medicine, and policy.